You will be given a reference e-book to read which has 229 pages And the test will be based on that e-book , you can take final test within 1 year of purchase. What are Electronics Health Records? Electronic health records refer to the systematic collection of all essential electronic health data and information regarding individual patients and populations. These records come in digital form and these can be theoretically shared across various health care settings. In the majority of cases, the process of sharing the records is conducted with the help of enterprise wide systems that are connected by network and any other useful information exchanges or networks. It should be noted that these records usually consist of a wide range of data including medical history, laboratory test results, immunization status, allergies and medications, vital signs, billing information, personal status essential to your health including your weight and age and radiology images. Effectively maintaining electronics health records is proven to be really beneficial not only to patients but to the entire health organization that run these records. Among the major benefits of the records include automatically sharing and updating essential information among various organizations and offices, efficient storing and retrieval, sharing vital multimedia information including medical imaging results, linking records to relevant sources and present research, easily standardizing patient care and services, reducing effort redundancy, providing effective decision support systems for professionals in the healthcare industry and lowering costs associated to the implementation of medical systems. These also work in efficiently automating and streamlining the workflow of a clinician. Deciding to enrol in the electronics health records certification program offered by Brainmeasures is the best moves that you can ever take if you are planning to become one of the most effective certified professionals in the health care and medical industry. This electronics health records course offered by Brainmeasures is extremely beneficial to a lot of people considering its proven ability to supply its participants with quality and accurate information. Once you take part in this online certification program, you will find it easier to undergo the company’s electronics health records training which is guaranteed to be really effective in letting you understand all the major components of electronics health records, the most essential patient data that you need to record, the proven advantages of electronically implementing health records, how you can efficiently transmit these records to various users and the many things that you can do to effectively maintain and keep accurate and updated records. By earning an electronics health records certificate, you will no longer have an extremely difficult time managing all your activities if you are part of the health care industry. How to efficiently translate scope of practice in the field of efficient EHR workflows? How to effectively optimize primary care and specialty medical practices? How to extend the access for electronics health records to patients and external physicians? The medical and health care industry is quite complex since it involves taking care of patients and helping them improve their health. 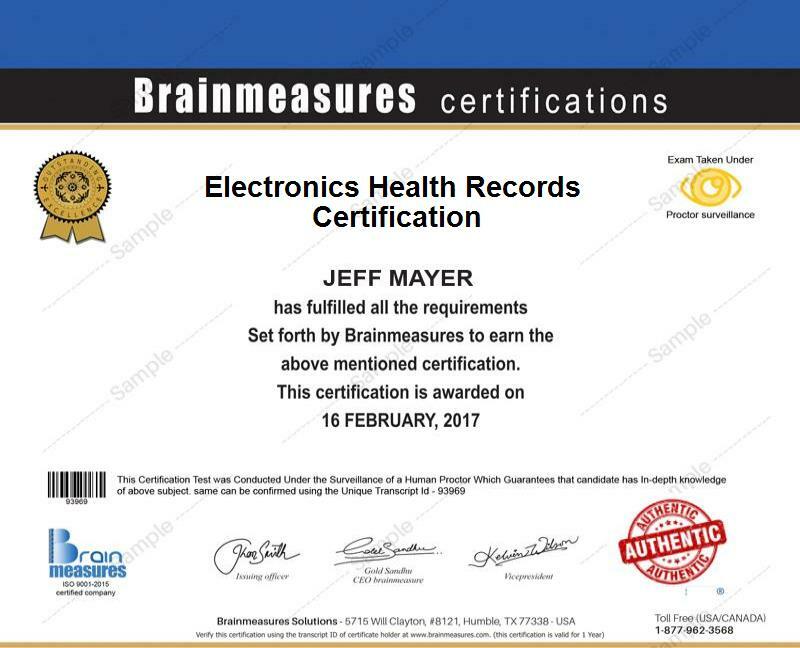 This is the main reason why taking up the electronics health records certification course offered by Brainmeasures is a huge help for you. This program is developed in such a way that it meets all the needs and requirements of medical and health care professionals including doctors, electronic health records specialists and any other individuals and professionals who strongly desire to work in clinics, healthcare facilities and physician’s and chiropractor’s offices. You can also expect your electronics health records certification to significantly boost your financial stability. Earning an electronics health records certification gives you the chance to effectively work as an electronics health records technician which entitles you to earn an average of $58,000 on an annual basis. Working as an effective electronics health records specialist is also possible which allows you to enjoy an average annual salary of $71,000.